In “Toward Antitumor Immunity and Febrile Infections: Gamma/Delta (γδ) T Cells Hypothesis” published in The Quarterly Review of Biology, Wieslaw Kozak, Tomasz Jedrzejewski, Malgorzata Pawlikowska, Jakub Piotrowski, and Sylwia Wrotek propose a mechanistic hypothesis that focuses on the potential impact infectious fever has on a particular subset of T cells, known as gamma/delta (gd) T cells. Infectious fever is the defensive and adaptive reaction that occurs when an organism’s immune system comes into contact with exogenous pyrogens, or pathogen-associated molecular pattern (PAMP). Upon recognition of these exogenous pyrogens, endogenous mediators—also known as endogenous pyrogens—engage the febrile system. 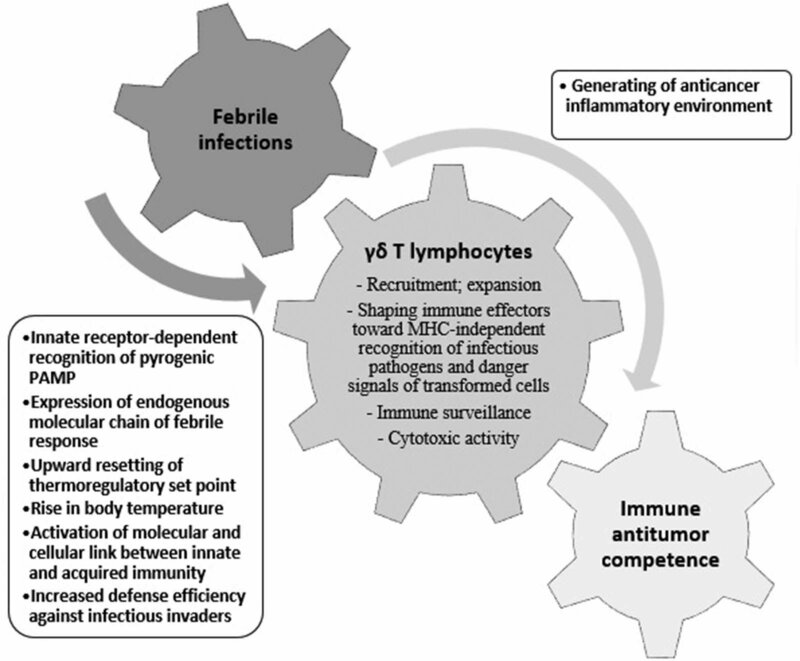 According to previous work by Shephard et al., a febrile system is composed of all of the mechanisms responsible for facilitating a fever as well as the various systems the fever affects. Thermoregulatory mechanisms are activated, resulting in the elevation of an organism’s core body temperature. The authors further elaborate on the function of endogenous mediators, like cytokines. “In short, endogenous mediators of fever redirect metabolic substrates and energy to the immune system during fever. This markedly enhances the frequency of a vast range of immune effectors, including lymphocytes expressing gd heterodimer receptors, which possess a potent anti-infectious and antitumor competence,” the authors write. Gamma/delta T cells possesses receptors (TCRs) comprised of gamma/delta chain heterodimer. In fact, the authors posit that the unique attributes of gd T lymphocytes—lower TCR variability, fewer gene segment rearrangements, and TCRs with older evolutionary memory—enable the cells to enact processes that aid in decreasing cancer risk, such as immune surveillance and attacking cancerous cells. Vg9Vd2 T cells are capable of responding to various types of cancer, such as carcinoma, lymphoma, prostate, myeloma, and sarcoma. Exposure to infection significantly expands the quantity of gd T cells. During infection, blood Vg9Vd2 T cells can increase in number until they constitute 60 percent of the total amount of lymphocytes.